Costa Rica is a dream vacation for adventurers and nature lovers, with its pristine sugar sand beaches, volcanoes, and abundance of wildlife. These islands off the coast are a paradise unto themselves that no visitor should miss. Lauded throughout the country as its most beautiful and idyllic Costa Rica island, Tortuga Island—Turtle Island in English—is a favorite destination of day-trippers. This Costa Rica island off the coast of the Nicoya Peninsula on the Pacific Coast boasts innumerable diversions to fill a sunny day from kayaking and peering through glass-bottom boats to snorkeling and swimming to hiking through the forested hills. Or you know, just head to the beach for some sun and surf on the beautiful Pacific. There’s even a canopy tour and zip lining course for adventurous souls to enjoy. If you're into scuba diving, this is the place for it. You might see angelfish, sharks, Spinner dolphins, octopus, and stingrays. There's also a dive site with sunken boats; you'll need a guide to take you there. Most boats head to Tortuga from Playa Jaco, although it’s also possible to book a trip from Puntarenas or Playa Montezuma. The boat ride, about 90 minutes from the mainland, is a pleasure in itself, with beautiful views along the way. Costa Rica’s Isla del Cano, right off the Osa Peninsula on the Pacific, is a compelling place for many reasons. Because the Costa Rica island is a biological reserve, its waters simply swell with sea creatures, perfect for snorkeling and diving. Sea turtles, dolphins, and pods of whales are frequently seen gliding through the channel. This beautiful island is surrounded by the greatest amount of coral on Costa Rica's Pacific side and sparkling water. There's a reason Isla del Cano is famous for its diving. But diving is controlled because it's a reserve, so you might have to wait your turn. Fascinatingly, mysterious stone spheres are scattered over the island—the largest weighs 2 tons. Their archeological significance still isn’t known, although it’s certain the island was used as a burial ground by coastal indigenous tribes. Cocos Island is probably Costa Rica’s most well-known and popular island destination—the 36-hour boat ride from Puntarenas is more than worth it. Located 340 miles from the Pacific Coast, the island is a UNESCO World Heritage Site and in the same class as the Galapagos Islands; the Cocos Ridge of underwater volcanoes goes from Costa Rica to just north of the Galapagos. Cocos Island is the only part of the Cocos Ridge that is above sea level. Jacques Cousteau called Cocos “the most beautiful island in the world” for a reason. Numerous plant and animal species are endemic to Cocos, and along with the translucent water, forests, rivers and tumbling waterfalls, an island is an extraordinary place for natural discovery. It is one of the top 10 scuba diving locations in the world because of the richness of the marine life in its waters. Treasure hunters, pay special attention: This remote Costa Rica island was once a favorite hideout of pirates and inspired Robert Louis Stevenson's "Treasure Island." 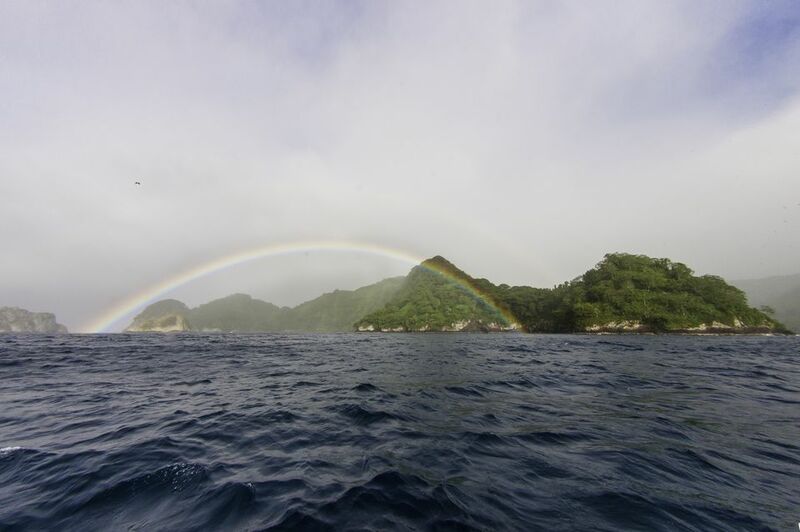 The entire island and the water that surrounds it make up the Cocos Island National Park, a designation that assures its natural assets are protected.